Before I begin this review I feel like I should tell you I am a bit biased. If you know me at all you'll know I am absolutely obsessed with J.R.R. Tolkien's novels AND the movies so when Lewis and I found out there was an entire restaurant dedicated to Hobbits (and LOTR in general) it might or might not have been a deciding factor in moving to Houston. We actually first visited this place on our scout out trip to Houston pre move, it was a stressful day so we wanted to do something fun for dinner. As an avid fan, the decor did not disappoint - you pull up to what looks like someones house with a patio covered by an old oak tree and twinkle lights (very Hobbit-esque) the inside is packed with art work, statues, signs, cardboard cut-outs, and they even had their very own Gollum lurking in a dark corner like usual, my precious. Hobbit Cafe is semi tucked away... okay scratch that, this place is really hard to find! Despite their being a sign out by the road, it sits in a circle of other restaurants so parking is a bit of a nightmare (I would recommend getting there no later than 4:30 and 10:00 am for brunch). This humble little hobbit hole features everything from craft and local brews, burgers, tacos, sandwiches, and vegetarian/vegan options a plenty! I ordered the salmon benedict with seasoned potatoes. The benedict was really well done, the salmon was moist and flaky, the eggs were poached nicely, and the hollandaise sauce was creamy and made in house (which seems rare nowadays) my only complaint was that my potatoes were slightly cold so that was a bit of a bummer. Lewis ordered the ginger pancake with a side of fresh fruit and bacon. The pancake was light and fluffy and the ginger flavor was definitely prevalent but I am not sue if I would order it again. One thing we appreciated was that almost every pancake had a designated syrup flavor, next time we're set on trying the blueberry cakes with blueberry syrup. One of the waitresses saw me taking pictures of this hobbit hole and she but her phone in there as a fireplace! 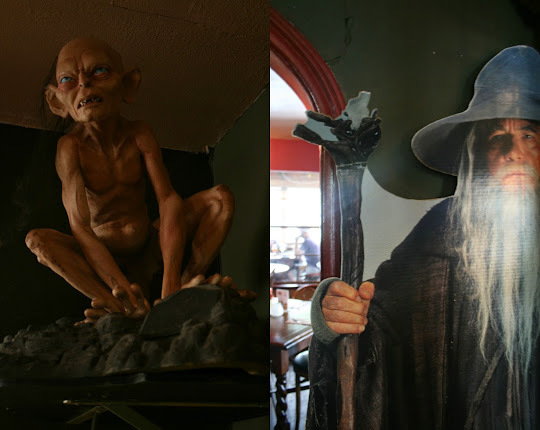 Going for brunch was nice, but if it's your first time venturing to the Hobbit Cafe I suggest you go at night, that's when the place is truly at it's full magical potential and you can better appreciate the candle lit tables. -Sauruman Sangria - The Dark Lord definitely has some influence on this drink, it's pretty powerful but delicious! This is a blended sangria so it's pretty much an alcoholic wine smoothie. -Chips & Guac - Really delicious and like everything else the portion is HUGE comes with fresh pico, tomatoes and sprouts. -Shrimp Rolls - These are like crab rangoon but 1,000 times better. -Fish Tacos - I was actually surprised at how delicious these were, the fresh corn tortillas and house made chipolte dressing made these! Possibly my favorite item I've tasted so far. -Black Bean Burger - Good flavor but I wasn't too fond of the texture of the burger, it was just a little too dry and crumbly for me. -Chicken Salad (Dwalin)- BIG fan, the grapes and curry really kick it up a notch fyi you get a choice between a half or classic portion, unless you want to eat off this for a week, I suggest you order the half. -Chicken Verde Enchiladas - Very good, I prefer these over the red ones. -Spinach and Mushroom Enchiladas - Super tasty, usually not a huge fan of mushrooms but they made them work - very hearty meal! -Regular and sweet potato fries - The one time I ordered sweet potato fries they were soggy but the regular fries are killer. -Key Lime Pie - Simple. Classic. Delicious. The Hobbit hole is a great place for a relaxing meal, whether it be second breakfast, elevenses, dinner, or supper (sorry I had too). The staff is as friendly and inviting as the decor, (ask for Megan, she is AWESOME) the drinks are unique and plentiful and the food is diverse and delicious. Even if you're not a LOTR fan, you'll fall in love with this quirky gem. It was magical! It was just what we needed to celebrate the unpacking and the turning in of the "Beast". Sorry we didn't get to meet Megan.